If you want a bit of history, masterfully blended with virtuosic instrumentation, sweet and sigh vocals – and, the occasional pun-filled yarn, then launch yourself straight into the arms of a Golden Bough concert. "Both educational and fun, Golden Bough's enthusiastic performance captured the hearts of our Children's Music Festival Workshop participants. Their joyful performing style enchanted the children leading to a natural outpouring of contagious merriment. 'Bring them back' we have heard again and again." "Golden Bough won the hearts of Redlands in 1996 and won them all over again in 1998. Thank you for bringing your joy and charm to the Redlands Bowl with your very special, unique and long to be remembered music." Florence Beeler, Program Director, Redlands Community Music Association, Inc.
"I suppose we receive more albums of music from Scotland to review than that from any other country. More than not the performers themselves are from North O' The Border, but this is an exception. With varying line-ups, Golden Bough, based in California, have been specialising in Celtic songs and tunes for around 25 years. Currently a trio, comprising Margie Butler, Paul Espinoza and Kathy Ross Sierra, they've produced an eminently listenable collection of well-know Scots ballads and, although many of these have been done to death in the past, it's to Golden Bough's immense credit that their versions of titles like "Wheel of Fortune", "Lizzie Lindsay" and "Sixteen Come Sunday" bring a feeling of freshness to the whole album. Recommended!" inspiration to all who believe in a better and healthier world. The trio Golden Bough, a name which has its origins in old Celtic mythology, has established itself in the interpretation of traditional Celtic songs with a love for the countries' rich history and music. It is worth remarking that Golden Bough is an American group that have collected traditional songs thanks to their travels. They have also released a CD entitled "Songs of the Celts," with songs and instrumentals from Ireland, Scotland, and England. Braes o' Bonnie Doon," and "Lizzy Lindsay." Most of the other songs are Golden Bough's arrangements of traditional tunes. On some of the numbers, they've invited guests from other groups such as The Wicked Tinkers, The Browne Sisters and Tempest. 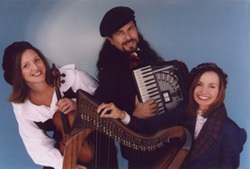 Golden Bough began in 1980 as a duo with Paul Espinoza (guitar, octave mandolin and accordion) and Margie Butler (flute, harp, bodhran) but with time other musicians joined them. At the time of their first CD recording in '81, they were a five-piece band. Various musicians came and went, and (many) CDs were recorded. the subject with the swing that reminds me of a folk dance. closes with the most typical Scottish instrument: the bagpipes. Good use is made of other pipes and whistles on all of the songs. An ideal CD to begin or end a wonderful vacation in the Scottish Highlands." "The trio known as Golden Bough are skillful traditional Celtic/Irish musicians and there's a lots of evidence of that on their latest release, Song of the Celts. Unlike Celtic fusion music, the traditional songs contained on this recording have a spark and vitality (whether slower and more gentle or rollicking and lively) that testify to a refreshing level of authenticity. Since I am the lead Celtic music reviewer here at Wind and Wire, I listen to a lot of it (Celtic music). While I seldom hear what I would consider a terrible Celtic album, groups like Golden Bough still manage to easily rise above the bandwagon-jumpers. There is a love of this music by the performers that is obvious. Of note, especially, are the vocal pieces on Song of the Celts, as well as Margie's harp playing, which simply sparkles. The vocal cuts may, in fact remind you (as it did me) of the outstanding English group Fairport Convention, owing to the group's great harmony vocals. The production here is flawless and tight. In addition, the arrangements on all the songs are excellent.